Update: Thanks to Francisco Ricardo, a video of some of Christian’s Purple Blurb reading is now online. The Spring 2012 Purple Blurb series comes to an end this week, not with a whimper, but with Christian Bök! currently a Professor of English at the University of Calgary. If you’re in the Boston area, and interested in radical play with language (why else would you have found this blog?) please come by. Developers of digital storytelling systems, take note: The call for papers for the Fifth International Conference on Interactive Digital Storytelling is now out. Conference to be held November 12-15, 2012 in Spain. 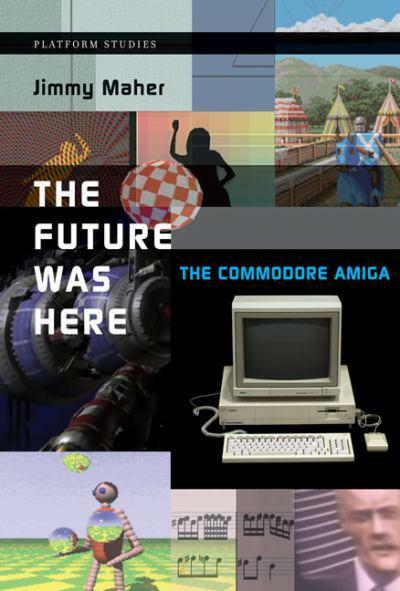 Congratulations to Jimmy Maher on his just-published book, The Future Was Here: The Commodore Amiga. As you might expect, Amazon has a page on it; so does Powell’s Books, for instance. This MIT Press title is the third book in the Platform Studies series. Jimmy Maher has done an excellent job of detailing the nuts and bolts of the first multimedia computer that was available to consumers, and connecting the lowest levels of this platform’s function to cultural questions, types of software produced, and the place of this system in history. The book considers gaming uses (which many used to brand the Amiga as nothing but a toy) but also media production applications and even, in one chapter, the famous Boing Ball demo. The Platform Studies series (which also has a page at The MIT Press) is edited by Ian Bogost and yours truly, Nick Montfort, and now has three titles, one about an early videogame console, one about a console still in the current generation and on the market, and this latest title about an influential home computer, the Amiga. We have a collaboration between two digital media scholars and practitioners of computational media; a collaboration between an English professor and a computer science professor; and this latest very well-researched and well-written contribution from an independent scholar who has, for a while, been avidly blogging about many aspects of the history of gaming and creative computing. Jimmy Maher, not content with his book-writing and voracious, loquacious blogging, has created a website for The Future is Here which is worth checking out. If you were an Amiga owner or are otherwise an Amiga fan, there’s no need to say that you should run, not walk, to obtain and read this book. But it will be of broader interest to all of those concerned with the multimedia capabilities of the computer. Really, even if you had an Atari ST – do give it a read, as it explains a great deal about the relationship between computer technology and creativity, exploring issues relevant to the mid-to-late 1980s and also on up through today. Amaranth Borsuk is the author of _Handiwork_ (2012), the chapbook _Tonal Saw_ (2010), and a collaborative work _Excess Exhibit_ to be released as both a limited-edition book and iPad application in 2012. Her poems, essays, and translations have been published widely in journals such as the _New American Writing, Los Angeles Review, Denver Quarterly, FIELD, and Columbia Poetry Review._ She has a Ph.D. in Literature and Creative Writing from USC and is currently a Mellon Postdoctoral Fellow in Comparative Media Studies, Writing and Humanistic Studies at MIT where she works on and teaches digital poetry, visual poetry, and creative writing workshops. Christian Bök is the author of _Crystallography_ (2003), a pataphysical encyclopedia, and of _Eunoia_ (2009), a bestselling work of experimental literature. Bök has created artificial languages for two television shows: Gene Roddenberry’s _Earth: Final Conflict_ and Peter Benchley’s _Amazon._ Bök has also earned accolades for his virtuoso performances of sound poetry (particularly _Die Ursonate_ by Kurt Schwitters). Currently, he is conducting a conceptual experiment called _The Xenotext_ (which involves genetically engineering a bacterium so that it might become not only an archive for storing a poem in its genome for eternity, but also a machine for writing a poem as a protein in response). He teaches English at the University of Calgary. Nick Montfort writes computational and constrained poetry, develops computer games, and is a critic, theorist, and scholar of computational art and media. He teaches at MIT and is currently serving as president of the Electronic Literature Organization. His digital media writing projects include the interactive fiction system Curveship; the group blog _Grand Text Auto;_ _Ream,_ a 500-page poem written on one day; _2002: A Palindrome Story,_ the longest literary palindrome (according the Oulipo), written with William Gillespie; _Implementation,_ a novel on stickers written with Scott Rettberg; and several works of interactive fiction: _Winchester’s Nightmare, Ad Verbum,_ and _Book and Volume._ His latest book, _Riddle & Bind_ (2010), contains literary riddles and constrained poems. My word-palindrome writing project (being undertaken as @nickmofo) has been boosted by Christian proselytizing, by Bök’s page. I am delighted to be featured in Christian Bök’s post on Harriet as an instance of conceptual writing on Twitter – named, in fact, right after @Horse_ebooks. This makes it particularly apt that Christian describes my writing as potential poetic “fodder.” Why not treat this feed of texts as the gift horse that keeps on giving? Please, feel free to make the tweets of @nickmofo into your chew toy. Steve McCaffery read at MIT in the Purple Blurb series on March 19, 2012. A recording of part of that reading (his reading of Carnival) is embedded above; the text of my introduction follows. Thank you all for braving the cold to come out today. Did you know that today is officially the last day of Winter? Ever! Winter is officially over forever! But I come not to bury Winter, but to praise Steve McCaffery, and to introduce him. Steve McCaffery is professor and Gray Chair at the University of Buffalo in the Poetics Program. He comes to us from there, and before, from Canada, where he did much of his pioneering work in sound and concrete poetry. He is one of those people who is know for his non-digital work but without whom the current situation of electronic literature, of digital writing, could not exist. He is in that category, for instance, with Jorge Luis Borges. You would have me institutionalized for loggorrhea if I attempted to read Steve McCaffery’s entire bibliography and discography to you. McCaffery’s critical writing can found in “North of Intention: Critical Writings 1973-1986” and “Prior to Meaning: The Protosemantic and Poetics” His two-volume selected poems, “Seven Pages Missing,” was published in Coach House in 2000. It earned him his second Governor General’s Awards nomination; his first was for his 1991 book “Theory of Sediment.” More recently, there’s his “Verse and Worse: Selected Poems 1989-2009,” which he and Darren Wershler edited. And, I’ll mention two other books, his “The Basho Variations,” published in 2007, which consists of different translations and version of Matsuo Basho’s famous haiku, which could be rendered clunkily as “old pond / frog jump in / water sound.” A digital version of this haiku can be seen in Neil Hennesy’s “Basho’s Frogger,” a modified version of the game Frogger in which the first row of floating items is missing so that one can only … you know … jump in. McCaffery is pond and frog and sound, placid and salient and resonant, and we are very lucky to have him here with us tonight. The students I teach now, like other university students I have taught, have the ability to read. They are perfectly able to move their eyes over a page, or a screen, and recognize the typographical symbols as letters that make up words that make up sentences or lines. The problems they face usually relate to a narrow concept of reading, which includes an unwillingness to read a wider variety of texts. These are not problems that are restricted to well-qualified, well-educated university students who are expert readers. As the networked computer provides tremendous access to writing and transforms our experience of language, all of are asked to rethink and enlarge our reading ability. One problem with reading too narrowly is the view that reading is only instrumental. People who spend a significant portion of their lives speaking to their friends and family members about nothing – simply because they enjoy company and conversation – will sometimes refuse to believe that reading can a pleasure in and of itself. Reading is too often seen only as a tool, to allow one to follow instructions, determine the ingredients in packaged food, or to learn about some news event or underlying argument. This is from an American poem, Sidney Lanier’s The Marshes of Glynn, published in 1878. It shows that it is not necessary to turn to some almost unrecognizable avant-garde poem to see how sound can overflow meaning, providing a pleasure that has almost nothing to do with communication. Lanier had a very musical view of poetry, but this poem does not need to be sung or played by an expert musician. Anyone who can read English can bring it alive. Another problem with a narrow concept of reading is not understanding the full range of what can be read. Students are comfortable reading pages and feeds, and reading emails and IMs, but it is not always as clear how they might read around in the library to explore as researchers, how they might read an unusual Web site or other complex digital object, or how they might read their daily urban environment. Those of us familiar with art and literature will habitually “view” something in the former category, perhaps not even noticing that it may be legible. To address this issue, I do turn to an almost unrecognizable avant-garde poem, Steve McCaffery’s Carnival, the first panel. This Canadian concrete poem, typed in a red and black in an amazing configuration of characters, seems to many to be an artwork but was created by a poet and published as poetry. Unlike the most famous Brazilian concrete poems, this is an example of “dirty concrete” that many do not even see, initially, as legible. Students who are able to assume the attitude of readers find that it can be read, however, and that it has an amazing ability to disclose things about reading: Our assumptions in how to trace words and letters in space, our ability to fill in partly-missing and entirely missing letters, the question of how to sound fragments of words and patterns of punctuation marks. When people learn how to speak a language – whether as an infant or later in life – they sometimes simply babble or chat. Everyone would agree that a learner should be allowed to enjoy speaking and listening, to enjoy making and hearing the sounds of a language, in addition to caring about the purposeful uses of that language. I believe it’s the same for reading. Reading is more than just a process of decipherment that provides an information payload. It gives us special access to the pleasures of language and to its complexities. Any sighted person, with or without any English, can look at the first panel of Carnival. But only a reader can both view it and read it, comprehending it as a visual design and as language. If a reader is unwilling to hear The Marshes of Glynn, it could be understood simply as a botanical catalog with some lovers traipsing about here and there. To hear, instead, the play of sound and sense, is to encounter something new, to understand another aspect of words and how they work.